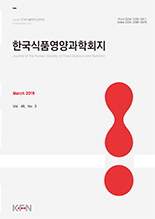 박성진, 김은실, 최영수, 김종대,(2008).괴각(Sophorae fructus) 추출물이 흰쥐의 항산화 활성 및 지질농도에 미치는 영향.한국식품영양과학회지,37(9),1120-1125. 괴각 추출물을 농축하여 동결 건조해서 실험동물인 Sprague-dawley rats의 해당식이에 0.5% 수준으로 첨가하여 4주간 사육하면서 체중은 3일 간격으로 섭취는 2일 간격으로 일정한 시각(오전 9시)에 측정하였으며, 활성산소 및 항산화 활성 측정은 2주 간격으로 측정하였다. 또한 실험이 종료된 후 실험동물을 단두 도살하여 혈청 중 total cholesterol, HDL-cholesterol, triglyceride, glucose, phospholipid를 측정하여 지질함량에 미치는 영향을 측정한 결과 아래와 같은 결론을 얻었다. 괴각 추출물을 Sprague dawley rats에 급여 후 식이섭취량, 식이효율 및 체중증가량을 측정한 결과 각 군 간에 차이를 보이지 않았으며 2주 간격으로 항산화 활성 및 활성산소를 측정한 결과 2주째부터 항산화에서 차이를 보였으며 활성산소 생성량은 대조군과 비교했을 때 큰 차이가 없었다. 4주 후 괴각 추출물 급여군의 항산화 값은 대조군에 비해 17.04%로 높게 나타났다. 실험식이 종료 후 실험동물에서 적출한 장기의 무게를 측정한 결과 심장, 신장, 장, 간 모두 커다란 차이를 보이지 않았다. 또한, 혈청중의 total cholesterol 함량 측정 결과 괴각 추출물 급여군이 대조군에 비해 낮은 함량을 나타내었고, HDL-cholesterol 함량에서는 대조군에 비해 높은 함량을 보였다. Triglyceride 함량은 거의 차이가 없었으며 glucose 함량은 대조군에 비해 낮았고, phospholipid 함량은 높았으나 차이가 없었다. 이상에서와 같이 괴각 추출물을 이용한 동물실험에서 항산화 활성 및 혈청의 지질대사에 개선 효과가 있음을 확인하였다. 향후 이들 추출물을 항산화활성 및 지질대사 개선에 기능성을 갖는 식품소재로의 이용 가능성이 기대되며 향후에 추출물 투여농도의 증가나 투여기간의 연장에 따른 추가적인 연구가 필요하다고 사료된다. This study was carried out to investigate the effects of Sophorae fructus extracts on antioxidative potential, free radical generation and the lipid levels in rats. Sprague-Dawley (SD) rats were divided into 2 groups of either AIN-76 diet (control group) or modified AIN-76 diet with 0.5% Sophorae fructus extracts for 4 weeks. The result were as follows: body weight gain and feed efficiency ratios were not significantly different in both groups. Antioxidative potentials were significantly increased in the group fed Sophorae fructus extracts compared to control group; however, there was no difference in free radical generation. Organ (heart, kidney, liver, spleen) weights in rats were not different in both groups. Total cholesterol level in Sophorae fructus group was significantly decreased compared to control group. Serum HDL-cholesterol level in Sophorae fructus group was significantly higher than control group. Serum phospholipid and triglyceride contents in Sophorae fructus group were no different from control group. These results suggest that supplementation of Sophorae fructus extracts may beneficially contribute to the effects of antioxidative potential and lipid levels in rats.